Well, it’s certainly been a busy Halloween weekend. As well as knocking up a batch of ghoulish cakes, and watching a selection of horror films including Night of the Demon, Halloween 5 and the BBC’s Ghostwatch, I also took a visit to the world’s first 18+ cake shop. The Eat Your Heart Out pop-up shop was open between 29 and 31 October and was located in the basement of Maiden in London’s hipster central – Shoreditch High Street. 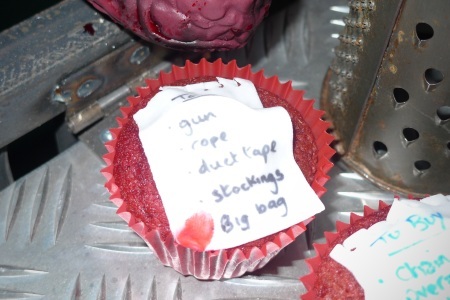 Each day, a selection of 666 gruesome cakes and biscuits were on offer to fans of slightly sinister food. Among the delights offered by the shop were Lily Vanilli‘s red velvet Bleeding Heart cakes, Occult Jam from jelly experts Bompas & Parr and the particularly grim-looking Human Centipiede biscuits from Alice Rose Cakes & Cookies. 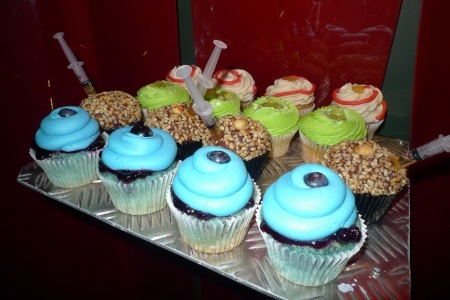 I was also especially impressed by the Psycho ‘to do’ list cupcakes from CakeyPigg. 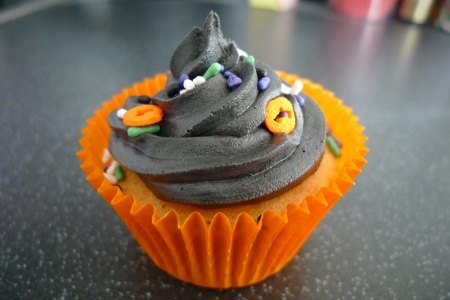 After spending a fair bit of time wandering round in the dingy basement, I eventually opted for a Wolfsbane cupcake from The Poison Series by Leshie Loves Cakes. 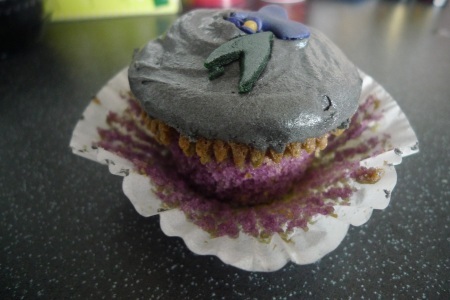 Along with purple-tinged sponge and a handmade Wolfsbane flower decoration, the scrummy morsel was topped with black Courvoisier icing which, if I’m honest, is what swayed my decision. Still high on a mixture of sugar and brandy-flavoured icing, I set about making my own batch of creepy cakes. 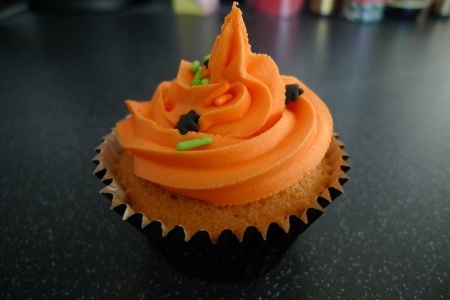 As I still had a Halloween costume to make, and a dwindling amount of hours available, I decided to keep things simple by making vanilla-flavoured cakes with contrasting orange and black cases and icing (see main picture, and the one below). 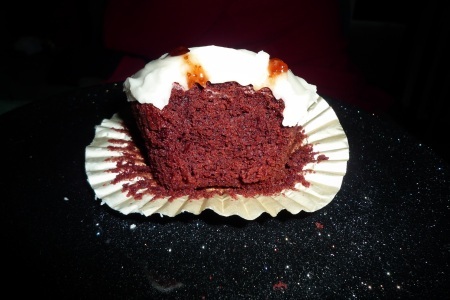 A special mention must also go to my mum who whipped up a batch of red velvet Dracula’s Bite cakes from Lily Vanilli’s A Zombie Ate My Cupcake book. I’ll think you’ll agree they look suitably ghoulish. 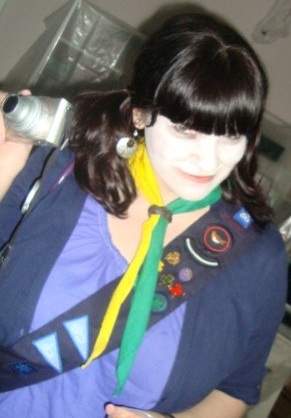 After hastily lining my stomach with a champion’s dinner of toast and a homemade cupcake, I set off to my chum’s halloween party dressed as a zombie girl guide, as you do. Upon arrival, preposterous amounts of rum and diet coke were consumed. This entry was posted on 01/11/2010 at 8:42 pm and is filed under Cakes, Out and about, Seasonal food with tags Baking, Cakes, Eat Your Heart Out cake shop, Food, Halloween, Lily Vanilli. You can follow any responses to this entry through the RSS 2.0 feed. You can leave a response, or trackback from your own site.